Senior functionaries and supporters of the Central Tibetan Administration were joined by thousands of people at the main temple in Dharamshala, India, to celebrate the 57th anniversary of Tibetan Democracy Day. At the event, which took place last Saturday [2 September 2017], Officiating President Ven Karma Gelek – President Dr Lobsang Sangay being currently on an oficial visit to the US – talked about human rights violations in Tibet, the development of Tibetan democracy in exile, and His Holiness the Dalai Lama’s ground-breaking efforts to preserve the culture and the identity of Tibetans. Gelek expressed concern about internal discord in recent years, urging Tibetans to remain united for their common cause, and called on China to resume dialogue with His Holiness the Dalai Lama’s envoys, hoping for a lasting solution to soon be achieved. The Tibetans living-in-exile celebrated the 57th anniversary of Tibetan Democracy Day in Dharamshala city, India on Saturday. Thousands of people, including Buddhist nuns and monks attended the function at the main temple in Dharamshala along with a host of other senior functionaries. Senior functionaries and supporters took part in the celebrations. President Dr Lobsang Sangay is currently on an official visit to United States of America. In the Democracy Day speech acting his stead, Minister Gelek talked about a number of issues ranging from the gross violations of human rights in Tibet, the resurgence of immolation protests in Tibet to the 1949 China's illegal occupation of Tibet and the Middle Way Approach, which seeks genuine autonomy for Tibet. "On this special occasion of the 57th anniversary of the Tibetan Democracy Day, the Kashag offers its deepest reverence and bow in deep gratitude to Tibet's most revered leader and the pioneer of Tibetan democracy, His Holiness the Great 14th Dalai Lama. The Kashag extends its heartfelt greetings to all Tibetans, and to our friends around the world." Speaking on the development of Tibetan democracy in exile, Ven Gelek said "Before the Chinese occupation of Tibet, even at a young age, His Holiness the 14th Dalai Lama set up a reforms committee in an attempt to make structural changes in the Tibetan political and administrative system and transform them into a modern democratic institution. But owing to many formidable challenges the changes weren't implemented. However, soon after his arrival in India, His Holiness followed his vision by making the political system of exile Tibetans a democratic institution." In the speech, the Kashag reiterated it's praise for His Holiness the Dalai Lama's efforts and achievements in promoting democratic values and steering the democratic system of CTA through timely administrative and legislative reforms. "In exile, His Holiness made groundbreaking efforts in preserving the unique religion, culture, language and identity of Tibetans. Hence, in India, the Central Tibetan Administration exile was established; schools, settlements, monasteries, universities and institutes of learning were also built in exile. His Holiness has over the years overcome many trials and tribulations and has through his visionary leadership continued to steer the Tibetans through the right trajectory.," he furthered. "Tibetan democracy was greatly strengthened with the election of representatives from all the provinces of Tibet and religious sects in the Assembly of Tibetan People's Deputies now called The Tibetan Parliament in exile. In an effort towards ensuring equal gender representation, female representative was elected in 1964 and seats for women were reserved in the parliament at a time when women in other democracies in the world were disenfranchised. "Taking stock of the increasing number of Tibetans in diaspora, reserved seats were provided to represent Tibetans in almost 40 different countries. The Tibetan Parliament in Exile is now a full-fledged and a vibrant legislative body both in terms of representation as well as its constitution." "Similarly, the Kashag was re-established in exile and procedures of appointing the Kalons were improved. In 2001, His Holiness announced his status as semi-retired and called for the first direct election of the Kalon Tripa, the executive head of CTA. A decade later he made a historic change with the announcement of devolution of his political responsibilities to the elected political leader. 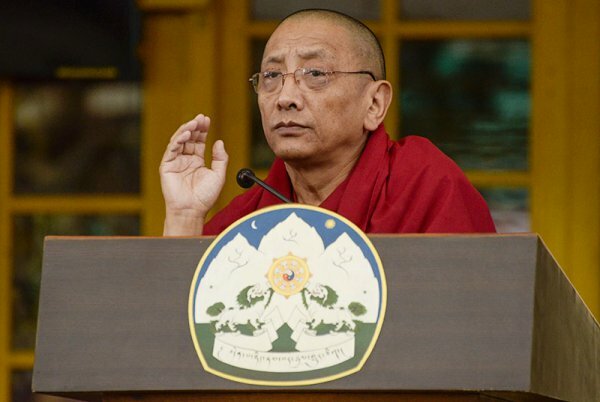 He declared on August 08, 2011 at the swearing-in-ceremony of Kalon Tripa that he has fulfilled his' long cherished goal' of bringing democracy to the Tibetan people. An amendment to the charter in 2012 changed the title to Sikyong. The English title for Sikyong is the President of CTA." "Despite the many hardships faced by an exile community including an increasingly scattered Tibetan population, the Tibetan community has over the last five decades successfully transformed into a fully functioning democracy that is lauded by many and has become a paragon of virtue for other exile communities. His Holiness' farsighted and visionary leadership made this possible. We therefore take this opportunity to express our deepest gratitude to our most esteemed leader." "The establishment of a full-fledged democratic polity in exile and the foundations of the freedom struggle, which is based on the principles of non-violence, have won many supporters and allies, in particular that of many Chinese intellectuals and democracy activists. The pinnacle of unity among Tibetans that was once pertinent during the reign of the three great kings of Tibet has once again been revived under the leadership of His Holiness the Dalai Lama. "However, unfortunate incidents of internal bickering and regional discord have in recent past negatively impacted Tibetan unity. It is incumbent upon a democratic polity to champion the cause of diversity of opinion but when infested with vested interests, it not only weakens the fabric of the community but also sows the seeds of discord and disharmony. Therefore, we once again urge every Tibetan to keep in their heart the wise counsel of His Holiness the Dalai Lama calling on Tibetans to be united for the common cause of Tibet." Condemning the gross and systematic violations of human rights and fundamental freedoms in Tibet, the statement says Tibet has been under illegal Chinese occupation since 1949. "Since the invasion of Tibet by communist China in 1949, over a million lives have been lost. The Chinese government continues to deny basic freedom for Tibetans and their failed policies in Tibet have exacerbated the human rights situation in Tibet. Consequently, 149 Tibetans have resorted to self-immolation protest since 2009. They have clearly expressed the aspirations of the Tibetans—restoration of freedom for Tibetans and the return of His Holiness the Dalai Lama to Tibet." "The Chinese government, instead of addressing the legitimate grievances of the Tibetan people has resorted to greater repression and in worse case, the criminalization of self-immolation. The abject disregard for basic human rights and a violation of the basic principles of the Universal Declaration of Human Rights. "In recent months we have also witnessed two cases of self-immolations in exile. While the Kashag empathizes with the intention of the self-immolators, but we believe that the life of every Tibetan is precious and that we must be alive to fight for our cause. Therefore, the Kashag appeals to every Tibetan inside and outside Tibet to refrain from resorting to drastic actions such as self-immolation. Specifically, the Kashag not only discourages self-immolation protests in exile but we urge the exile Tibetans to pursue more powerful means by honing one's educational, professional and personal competency to substantially contribute to the Tibetan cause." On the occasion of Tibetan Democracy Day, the Kashag has appealed to the Tibetan public to heed to the ethical practices of Buddhism. "Tibetans are expected to not be ostentatious and instead invest in the health and educational pursuits of fellow Tibetans, especially that of the younger generation of Tibetans and thereby strengthen the social and educational foundations of the Tibetan freedom struggle. Tibetans are expected to put their efforts in preserving the unique Tibetan religion, culture and language, which form the very basis of our Tibetan identity." "Although the Constitution of PRC as well as the National Regional Autonomy Law provides for the right to preserve and promote one's language and religion, however reality suggests otherwise. Tibetans in Tibet are denied this right and face impediments in practicing their language and religious faith. "The systematic clampdown on religious institutes and members of the monastic community are akin to the days of the Cultural Revolution. Since last month, demolition and eviction of residents at Yachen Gar have begun. The large scale demolition and forced eviction of monks and nuns at Larung Gar that began in July last year evince the attempt of Chinese Government to control Tibetan culture and religious life and is an act of trampling on the basic religious freedom and fundamental rights of the people in Tibet." Starting from March of this year in the so-called Tibet Autonomous Region, a propaganda campaign called the "Four points of importance and four points for affection" was started. Under the banner of "To love your country, give importance to unity", the fight against separatism and defamation of His Holiness the Dalai Lama has been amplified. If the Chinese government is genuine in their approach to resolving the long-standing issue of Tibet, it is expected of them of refrain from shifting the blame on His Holiness and instead benefit from His Holiness' wise leadership, the statement reads. "As recognized by many intellectuals and world leaders alike, the Chinese government should accept the fact that His Holiness the Dalai Lama presents the best opportunity and solution to resolving the issue of Tibet. While we remain committed to constructively engage with the Chinese leadership, we call on them to resume dialogue with the envoys of His Holiness the Dalai Lama. "In autumn this year, we will witness an important change in the composition of the Chinese leadership during the 19th Party Plenum. With this change in leadership, we hope for a lasting resolution to the issue of Tibet through the Middle Way Approach. The Kashag said that it reaffirms its commitment to the Middle Way Approach as envisioned by His Holiness the Dalai Lama in gaining genuine autonomy for the Tibetan people within the framework of the Constitution of the People's Republic of China."